Look at the rocker inside the TS switch in the video. See the center stalk that pushes the rockers? There should be a small ball bearing with a spring in the center stalk. Jegs, Summit and Speedway show a brake booster clevis 3/8-24 thread. Not sure of thread type for the 240Z/280Z. They also sell push rod extension kits. I seem to recall (10 years ago) that the 240Z and 280s push rods were of different diameters and he clevis pins were different . When I swapped in a 280Z booster into my 240Z I swapped the 240Z push rod into the 280Z booster so I could use the 240Z clevis. My pedal has some slack, but the clevis is adjusted all the way out. If you find a way to lengthen the clevis post your solution here. Check out the rear springs, take some pictures, and post your findings here. The previous owner may have cut the springs, installed softer, or progressive rate, springs etc. At some point you may want to rebuild/upgrade the stock suspension: shocks, springs, polyurethane bushings, insulators etc. Makes for a huge improvement in handling and ride. Recommend stiffer springs that maintain stock ride height for a street car. The 240Z is low enough. Confirm that the connections on the ballast resistor, coil and distributor are clean and snug. Not sure how you arrived at Toyota front and back. Won't work. The Toyota calipers only go on the front because they have no parking brake function. The 240SX calipers have a parking brake function. So they only go on the back. Zero noise. Lots of initial dust, but I dont care. I abused the pads until they smoked and no fade. Try them. What to do about Z brakes? "The stock Z brakes are adequate for street driving, autox, and drag racing. The stock Z brakes are adequate for street driving, autox, and drag racing. This is not a joke. 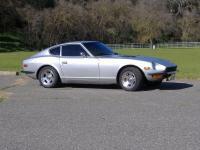 Even with a V8 or turbo pushing lots of hp; The stock Z brakes are adequate for street driving, autox, and drag racing." - JMortenson Experiment with pad and shoe materials. After experimenting with all of the popular brake pads such as Hawk, Porterfield etc. I prefer Carbotech AX6 material. Excellent cold bite that grabs hard the hotter the pads get. Budget Build You can build a reliable daily driver following the JTR V8 conversion manual for not a lot of money. Basic daily driver swap: Stock SBC engine. JTR, MSA and John's Cars sell swap kits. Each has good and bad points. Do a search before you buy. Keep stock R180 differential Camaro WC T5 five speed transmission. Speedometer drive gear has to be changed to match the differential ratio if you keep the stock speedometer. Ref JTR Rebuild stock brake system and install braided SS brake hoses. Suggest Carbotech AX6 pads and shoes. Stock brakes are fine - see brake FAQs Replace shocks/struts e.g., Tokico Replace stock suspension bushings with polyurethane bushings. Replace sagging springs with stiffer springs that maintain stock ride height. Front 180lb/in Rear 200lb/in to 280lb/in. Install an aluminum radiator. Stock mechanical fan is ok. Do the basic things to make the car safe and reliable and then drive it. Read the JTR manual at least five times and study Hybridz V8 swaps until your eyeballs fall out. Start with an unmolested Z car with minimum rust. Just go to a parts store and ask for heat riser flex tube of the correct diameter. Summit Racing probably sells the flex tube as well.